Bishop Lloyd's Palace, otherwise known as Bishop Lloyd's House is located at 41 Watergate Street, and 51/53 Watergate Row. 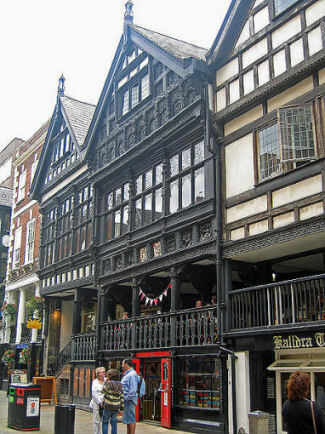 The architectural historian Nikolaus Pevsner considered it to be "perhaps the best" house in Chester and It has been designated by English Heritage as a Grade I listed building. There are shops on the ground floor level of the building and at the level of the row. The house above is open free of charge to visitors at advertised times. It has two large meeting rooms which are available to hire. The building also contains the headquarters of the Chester Civic Trust. The half timbered house originated as two town houses which were constructed over medieval undercrofts. During the seventeenth century the two existing buildings were converted into one. The rebuilt house broke with the medieval fashion of having the main residential accommodation in a great hall at the row level; instead the principal living accommodation was in two "elegant chambers" in the floor above the row. The house has associations with the Welshman George Lloyd, who was Bishop of Chester from 1605 to 1615, Bishop Lloyd was educated at the Cathedral Grammar School in Chester, he died in 1615 and was buried in the Choir of Chester Cathedral. By the onset of the nineteenth century the building had deteriorated, the carvings on its frontage had been covered with plaster, the house had been split into tenements and was in a very neglected state. It was heavily restored by Thomas Lockwood in the 1890's. The east house was refronted to match the west house and a flight of steps from the street to the level of the row on the east side was added. The 18th-century sash windows were replaced with more suitable mullioned windows with decorative leaded glazing.